Micro-greens are among the easiest plants to grow at home. Growing from seeds might be new and different experience but once you get hang of it you'll be hooked! 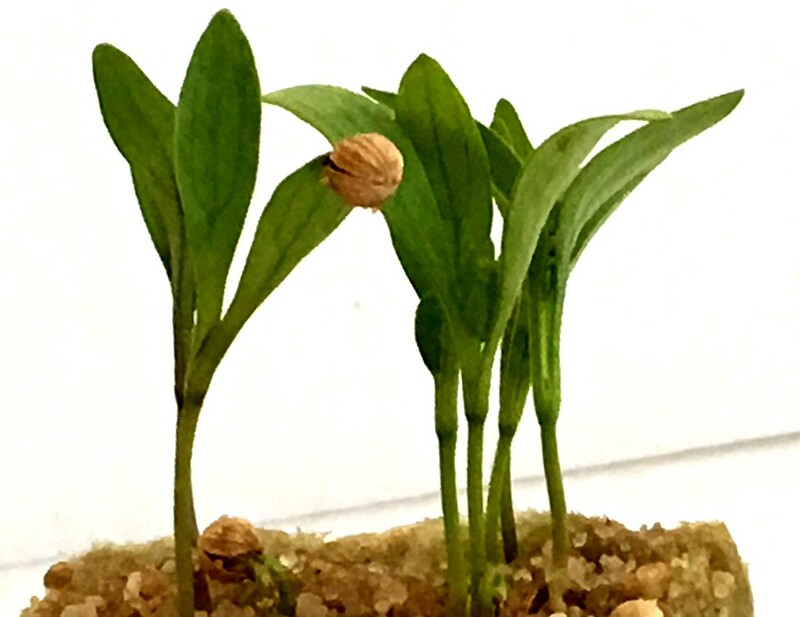 The miracle of seeds! Every seed contains all the food and energy it needs to burst out of its shell and start growing. Just add water. Seedlings emerging from Rockwool Grow Cubes. Wash tray with a mild bleach solution. Make sure your grower tray is clean, clean, clean. 1. Position Grow Mat on bottom of grower tray. Our Grow Mats measure 19" x 9" and are designed to fit a standard 20"x 10" grower tray . If your tray is a different size simply cut the mat with a scissors to fit the tray. 2. Saturate Grow Mat. Pour water over pad until it is floating in about 1/2" of water. Let mat sit in water until saturated - several hours or overnight. Mat will turn darker once saturated. Nutrients or rooting solution are not necessary. 3. Grow mat should be moist - but not floating. Pour out excess water at the sink. Pour off excess water at sink and you're ready for planting! Rinse seeds thoroughly. Some seeds require soaking before planting. Always read the seed packet for special instructions. Spread seeds evenly over mat. Don't be skimpy! Seeds should be almost touching each other. It doesn't have to be perfect - and it won't be - but you want good coverage. Seeds will sprout in a couple of days. When the plants have grown 2-3 leaves - usually about a 7-10 days after they sprout - it's time to harvest. This is when micro greens have their best flavor. Wait too long and they turn bitter to taste. In the beginning, water by misting seeds thoroughly once a day. 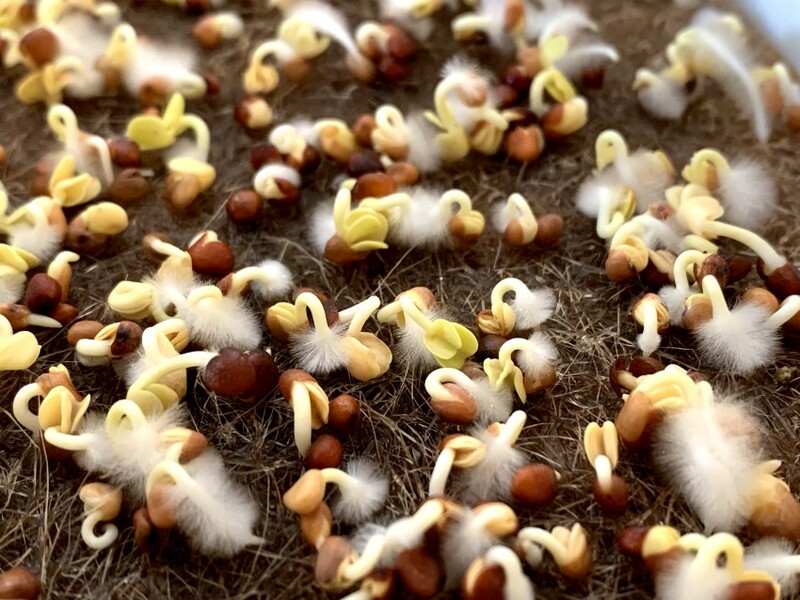 As the Grow Mats absorb water, their unique fiber construction promotes air movement around the seeds which prevents disease. 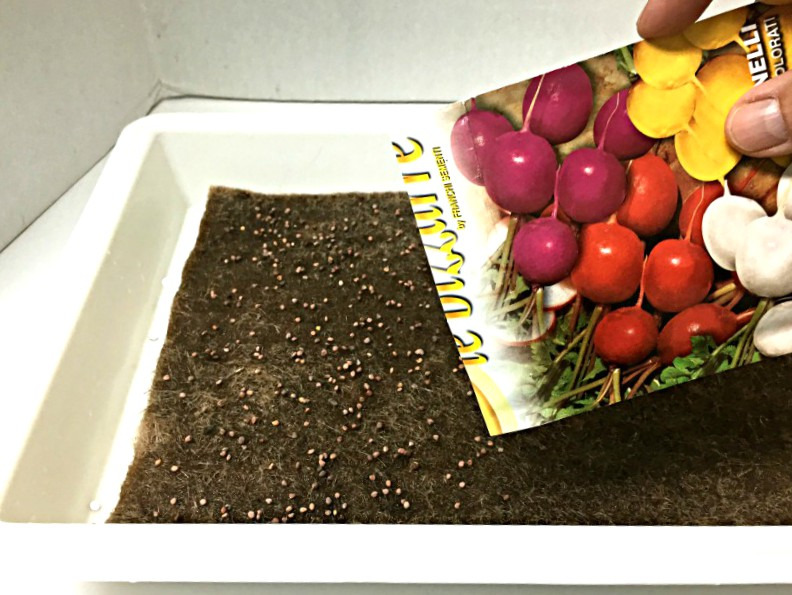 Keep seeds and Grow Mats moist but not floating in water. Keep seeds moist by misting. 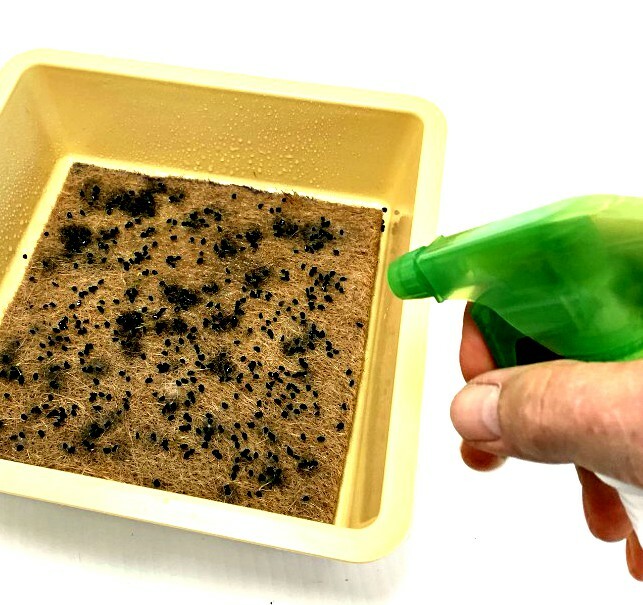 After seeds sprout, start watering by pouring clear water in one end of the tray (fertilizer can be harmful for tender young plants). Tilt the tray so the water moves to the opposite end. Add enough water to thoroughly saturate the Grow Mat. Pour off excess water if necessary. This is a BIG advantage using Grow Mats. The only way to water seedlings in soil is by pouring water on top of plants. With soil It's impossible to water evenly and tender young plants damage easliy. Watering with Grow Mats is easy! 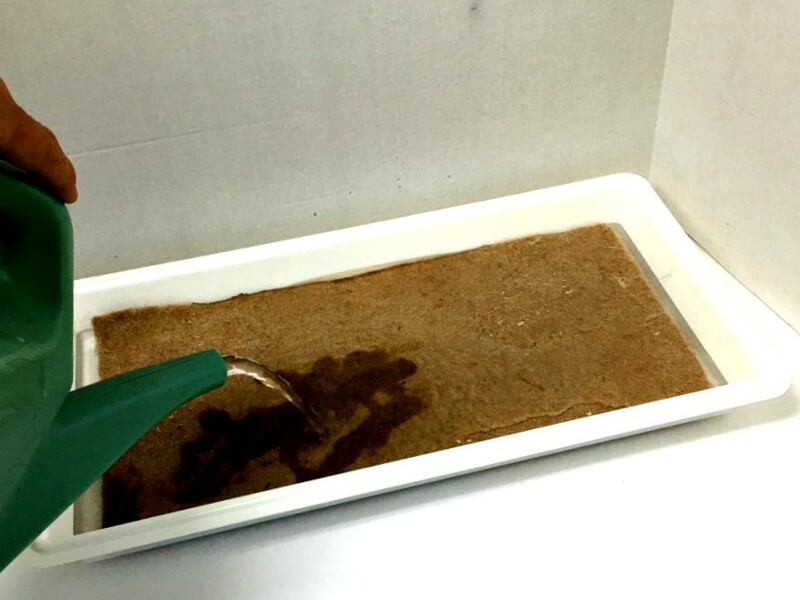 Simply pour water into a corner of the tray and tilt tray back and forth to distrubute the moisture. Keep mats moist but not floating. 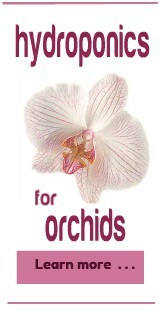 Frequency of watering will depend on light and temperature in your growing area. 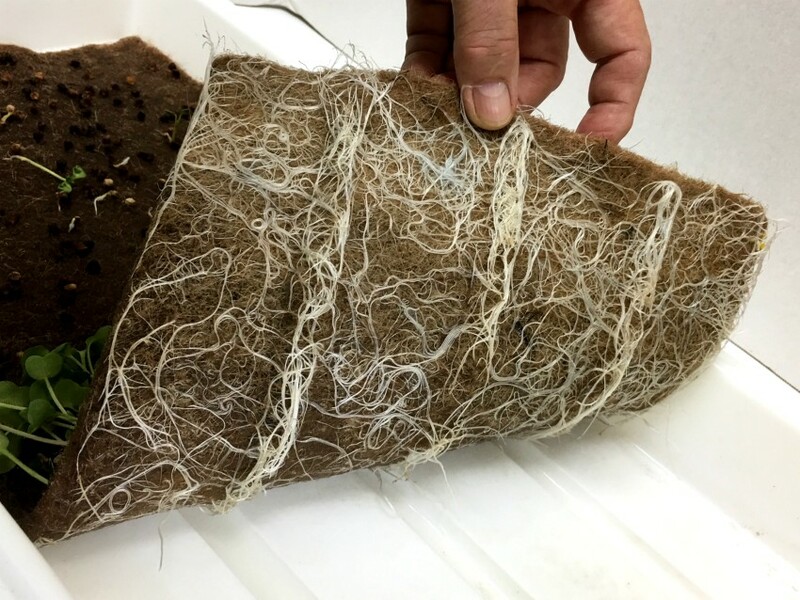 As the seedlings mature, the Grow Mats provide a clean, even balance of air and water at the roots. Healthy roots mean strong plants that will be loaded with flavor and nutrition! Healthy roots mean healthy plants! 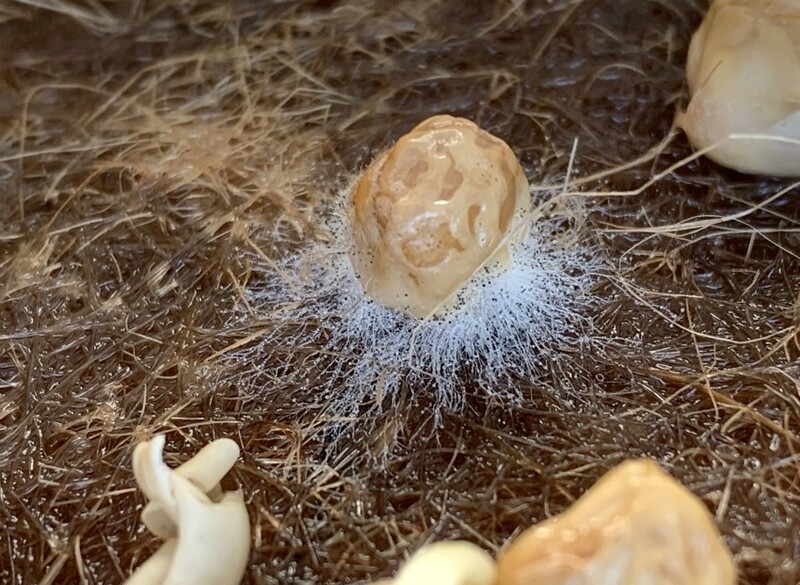 Grower Tip: It's not unusual to find mold on new seedlings. Mold isn't a problem if you take immediate action. Some mcrogreens (like radish) grow fibers from their roots that look like mold - but isn't. Look closely - if you see white fibers growing from the roots everything is okay. Fibers growing from the seed itself is mold however. 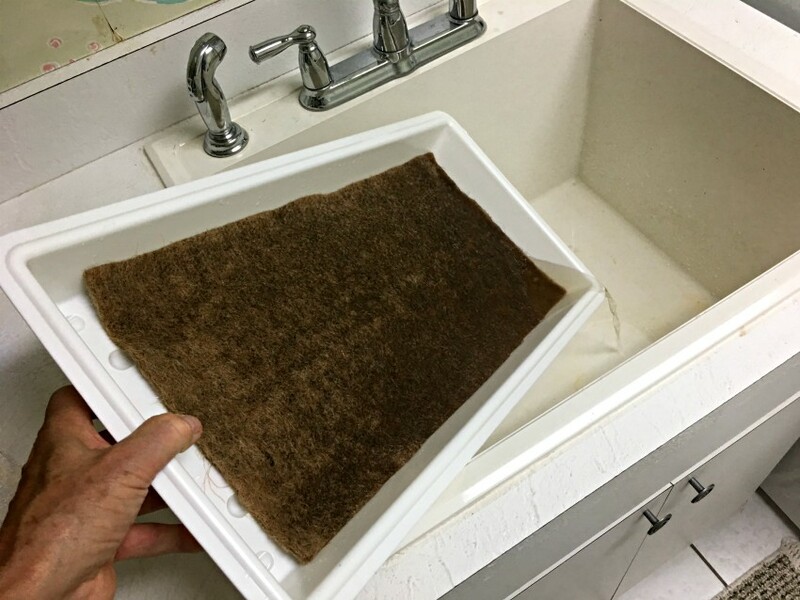 This is not mold because fibers are growing from the new roots. When the first 2 leaves appear, your plants are mature (already!). This can be anywhere from 7 to 21 days after planting - depending on type of plant. 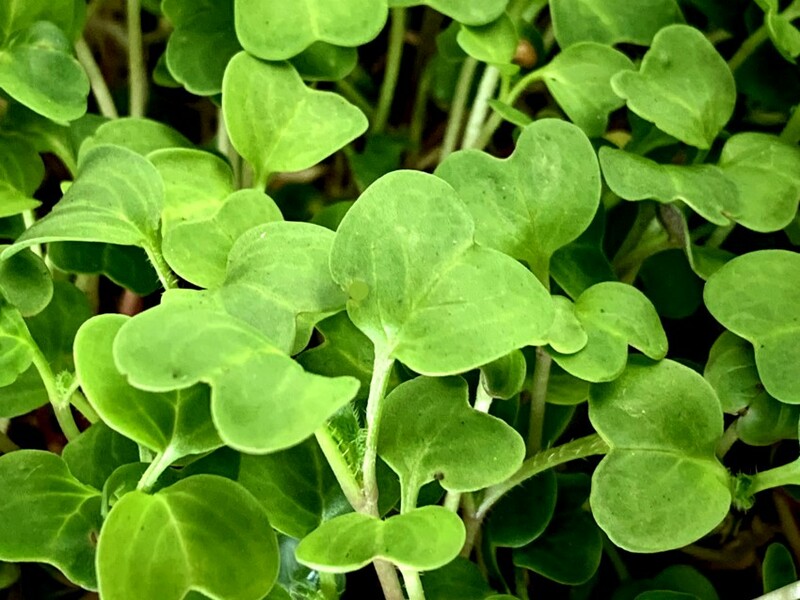 Microgreens start to loose their flavor and turn bitter if they're not harvested within several days of maturing. 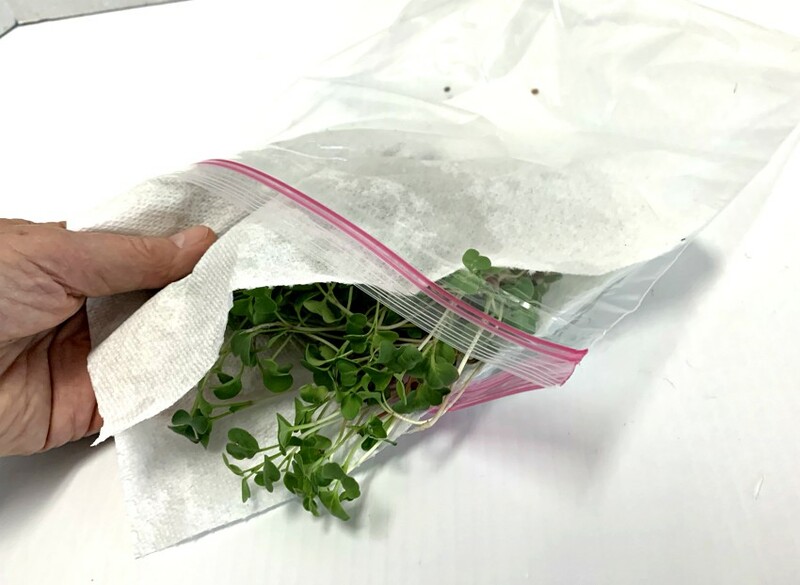 There are 2 ways to harvest micro greens: 1) snipping greens with a scissors just above the mat or 2) gently pulling entire plant from grow mat. 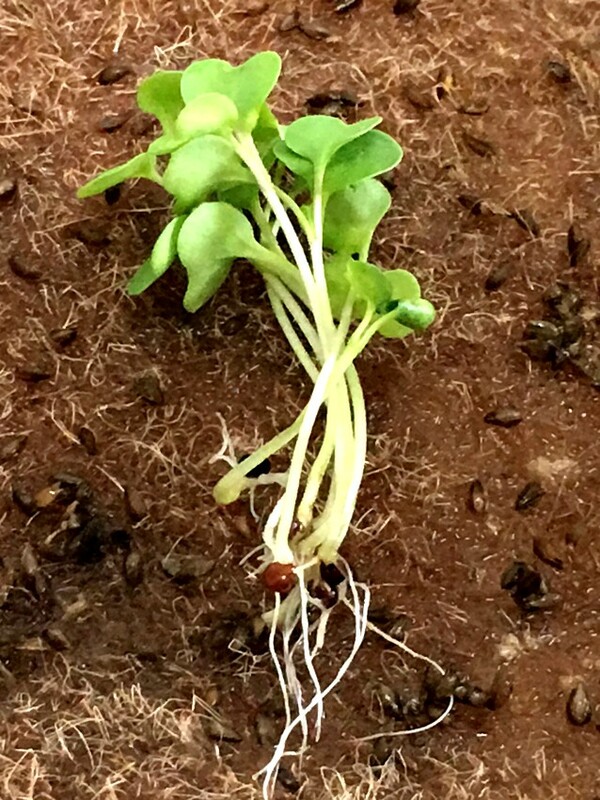 Harvesting mature microgreens by pulling plants from jute grow mat. Pulling plants from the mat keeps most of the roots attached. Roots are edible and they add crunch and flavor. Roots are edible and add an interesting crunchy flavor. Yum!! 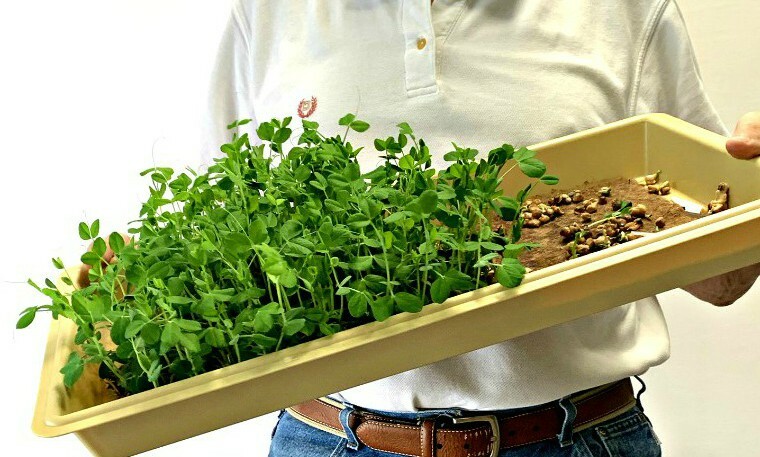 Of course, the freshest tasting microgreen are plants that are consumed directly from the grower trays. But microgreens can also be stored in the fridge for up to a week. 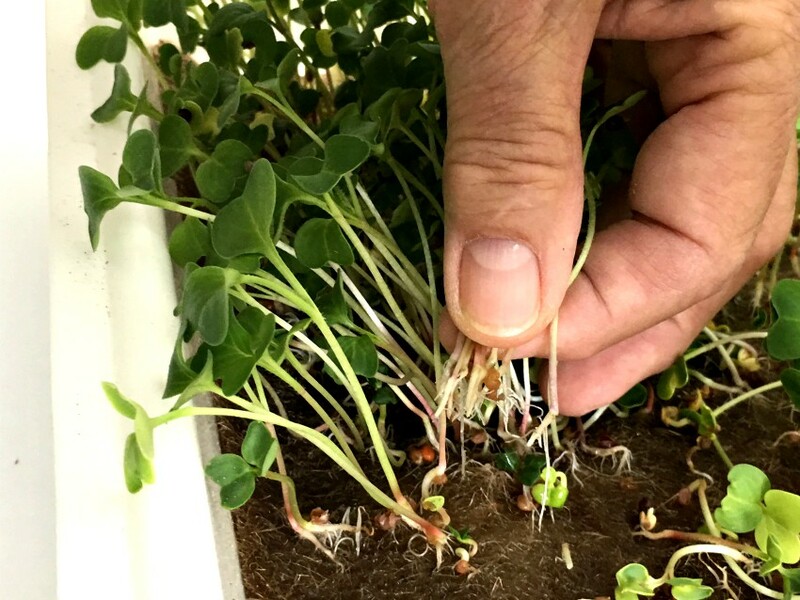 Microgreens stay fresh longer if you keep them dry after harvesting. For storing, line a plastic bag with paper towels to absorb moisture. Insert micorgreens between paper towels to keep them as dry as possible. Store in refrigerator. Microgreens can be stored in the refigerator for up to a week. Simply wash them in clear water at the sink and dry with a paper towel or a salad spinner before eating.